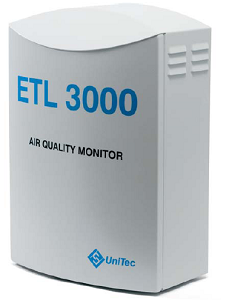 The ETL3000 is a multi-component air quality monitor for measuring airborne pollutants in parts per billion (ppb) concentrations. The system is based on a new solid-state thickfilm sensor technology, which provides excellent sensitivity and accuracy. The performance of the sensors is superior to conventional electrochemical cells. The monitor provides measurement of CO, NO2 and O3. The system has a built-in data logger and a GSM modem (optional). Analysis of C6H6, CH4, SO2, H2S, NH3 with thick film sensor is also available as option. In addition ETL3000 can acquire measure coming from a weather station and store them in the internal data logger. The ETL3000 is designed specifi cally for outdoor installation. A mounting kit is supplied, suitable for any pole diameter. The electronic part is based on a microprocessor with fl ash memory and it is completely separated by the sensors. Each sensor is independent and is installed inside its cell (SENS3000) and connected to the electronics with plug-play connectors. The sensors can be replaced easily in the fi eld or removed to allow calibration at laboratory. - THICK FILM SOLID STATE SENSORS (CO, NO2, O3 AT PPB LEVELS). - 16 D.O., 15 D.I.